It is every online retailer’s goal to gain a remarkable influx of traffic to their website. Online shopping has seen an astonishing upward trend over the years. Shoppers are making more purchases online than in physical stores. Nonetheless, the thriving number of online shoppers are directly proportional to the shopping cart abandonment. 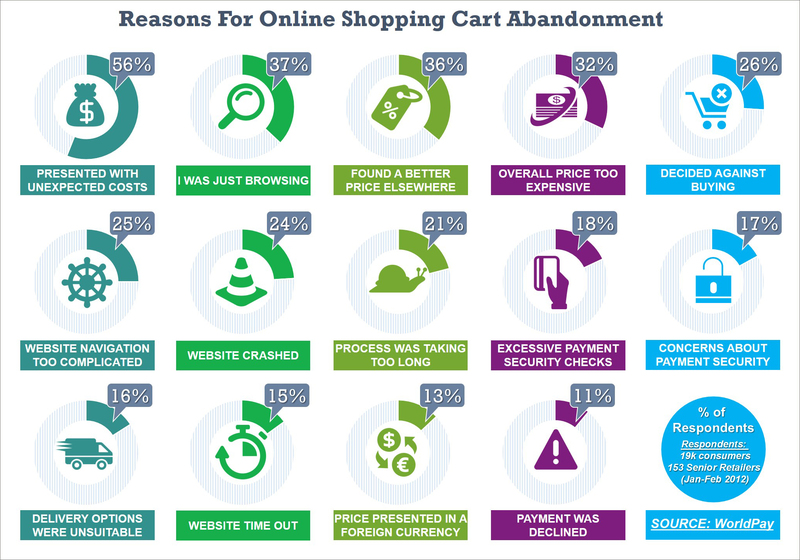 Latest studies revealed that on an average there’s a 68% cart abandonment rate. A research also showed that there’s a roughly $4 trillion worth of merchandise that will be abandoned through online shopping carts. So from the headache of attracting more shoppers to visit your website, your new predicament is how to reduce shopping cart abandonment rate. How will you turn leaving customers into paying ones? The answer is a simple yet very effective shopping cart abandonment solution for your online store: Exit-intent Popups. 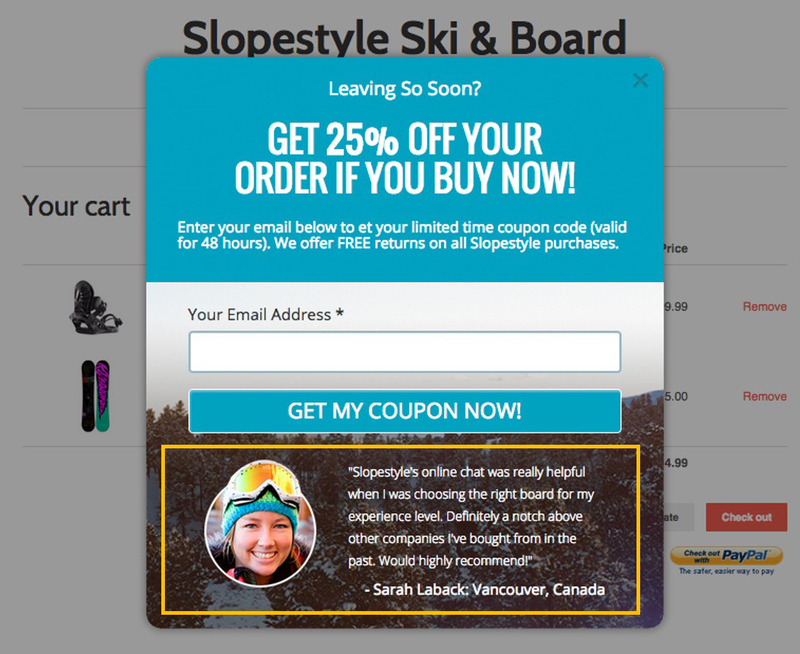 Don’t leave me: How does exit-intent popup work? Exit-intent technology examines online visitors’ mouse movements and detects when they are about to leave the website before purchasing an offer. You have probably encountered exit intent technology in motion. Remember the time when you were looking for a perfect gift. You’ve searched through various websites before buying the best item. 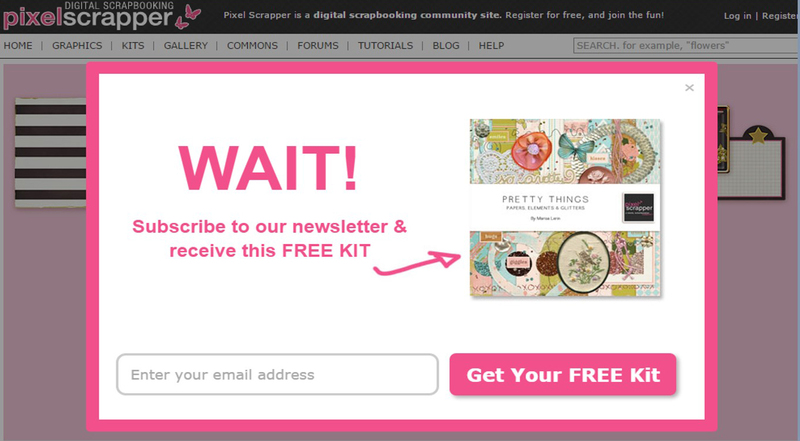 In the websites you’ve skipped, could you recall if there’s a message popup when you were about to leave the site? If yes, that is the “exit intent popup”. Exit-intent popups are among the most popular and efficient shopping cart abandonment solutions nowadays. The most imperative chunk to successfully use the exit intent technology is crafting your call to action. Understanding why online visitors abandon their carts is a crucial piece of the puzzle. In fact, it should be your first step prior to deploying exit-intent popups. 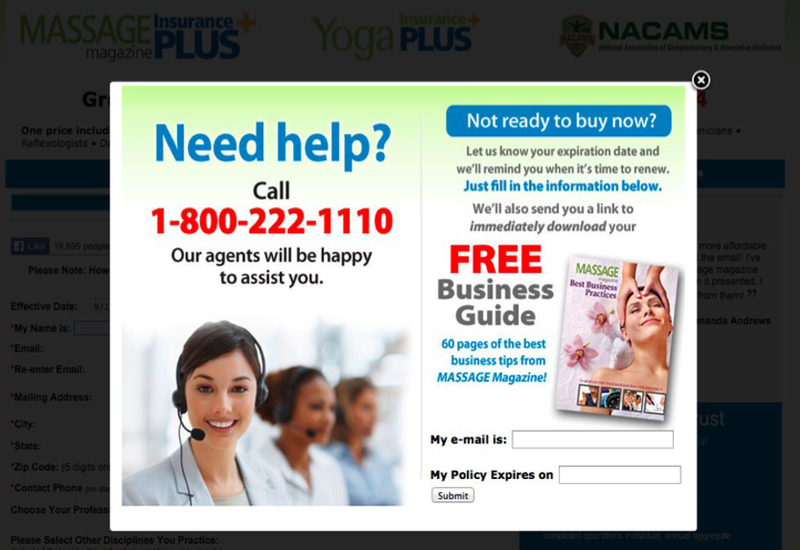 Hey, come back: How to put exit-intent popups into practice? Almost 6 out of 10 consumers stated that they were presented with unexpected costs. While 3 out of 10 shoppers said that they have found a better price elsewhere and/or the item was too expensive. And so, they leave your site. Nowadays, consumers have the power to compare different products concurrently. Come to think of it, if shoppers could get the same item for a lower price from your competitor why would they purchase it from you? Well, the remedy is simple: offer them something they won’t be able to refuse. Make it free, remove the shipping fee: Encourage your online shoppers not to abandon their carts by offering a free shipping. 93% of online shoppers said that they are encouraged to buy more products online if free shipping is offered. Trim it down, cut the amount: 10% of online shoppers reported that they were hoping to get a discount on the product later. So why do you have to keep them waiting? Offer them a discounted price before they leave. Window shopping happens when you don’t have any intention of buying but you go from one store to another and literally just look through what is displayed in a store’s window. And as time goes by, the traditional window shopping has expanded to the online world too. 37% of surveyed consumers said that they were just browsing. They are either letting the time pass or exploring for a future purchase and so they abandon their carts. You can beat this by taking advantage of time: drive urgency. What are the best ways to make them hurry? Limited-time popups: 48% of online window shoppers said that they will purchase a product if offered a limited-time discount. But be careful, if you serve it too often, you’ll spoil the element of surprise and risk losing your credibility. Understand your online shoppers’ behavior to calculate the right timing. Limited-supply popups: Popularly used by hotels, showing a popup that your rooms are about to be fully-booked generates that sense of urgency to close their shopping carts right there and then. 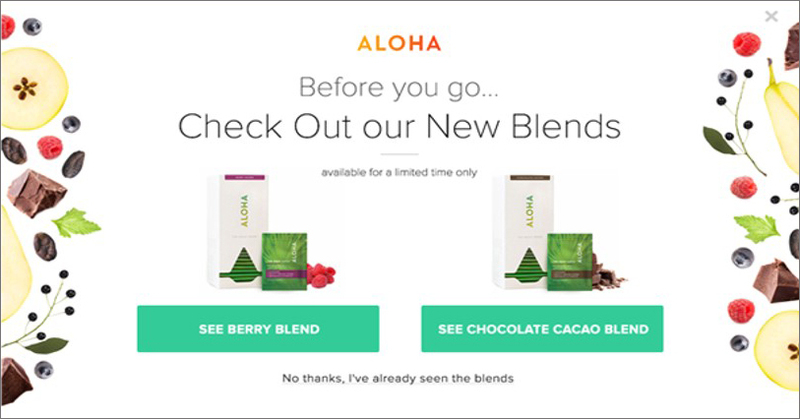 Popular or new products popups: Promote your best sellers or new items when your visitors are about to leave. Online shoppers may just be browsing now but when they see a popup of that popular or newly added gadget, then they might want to get it in a rush. Often online marketers want to catch the attention of online visitors that they want to put a lot of things all at once. But too much is overwhelming. In fact, 25% of online shoppers abandoned their carts because the website navigation was too complicated. Imagine if you are presented with a 2”x2” sized marketing pamphlet with 1000 words in it. Would you even bother reading it? The more complex your message is, the harder the reception from your audience will be. 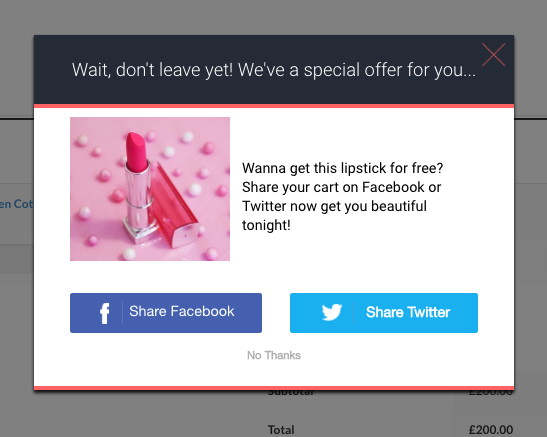 Craft your exit-intent popups by hitting two birds with one stone. 17% of online shoppers abandoned their shopping carts because they were worried about payment security. Who doesn’t worry when your personal information is at stake, especially if money is involved? If online shoppers don’t trust you, they won’t buy from you. The best way to establish and build trust is to certify that your website is a secure and trusted place to create transactions. What are the most reliable ways to establish security and build trust? Exit-intent popup of an authentic customer review: The most trusted source (30%) for online shoppers to buy from an unfamiliar website is through customer reviews. Visible trust signs in your popups: The second biggest factor for online shoppers to trust an unknown website is through trust signs like Norton or Truste. Online customer’s inability to select the most appropriate option for a certain process is one of the top reasons why they leave their shopping carts. It was revealed that around 16% of online consumers did not have options in delivery, currency, and payment. Sometimes, online shoppers want to buy a product but they don’t have enough options to proceed. How do you give them the power to choose? It’s simple, offer them help. But it should not take them too long to receive assistance. It should be a real-time solution. What is the proven real-time help? Live support exit-intent popups: 44% of online consumers want to have their questions answered by a live person right in the middle of the online purchase. They are also more likely to visit your site again if they found out that they can have a real-time support. Although many exit-intent popups use generic messages, more cutting-edge exit intent technologies can personalize the popup message based on the behavior of the customer. 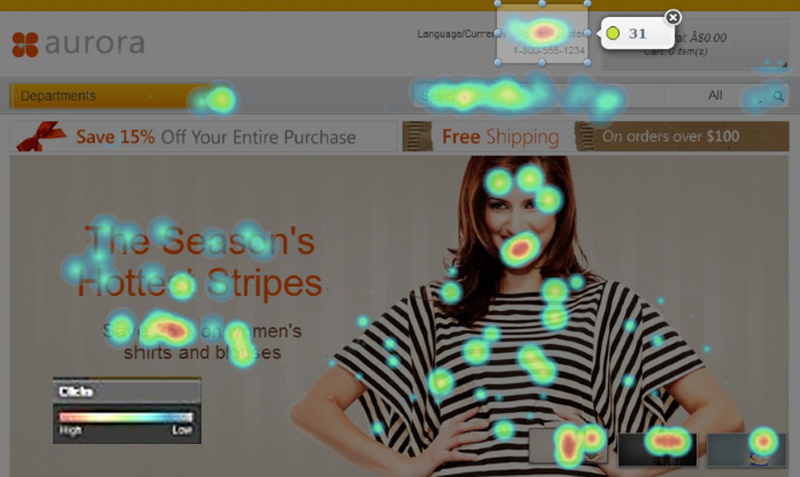 The power to predict a customized message relies heavily on ‘heat mapping’ the customer clicks on the website itself. With that power in your hand, you can now see the most suitable message to include in your exit intent popup. 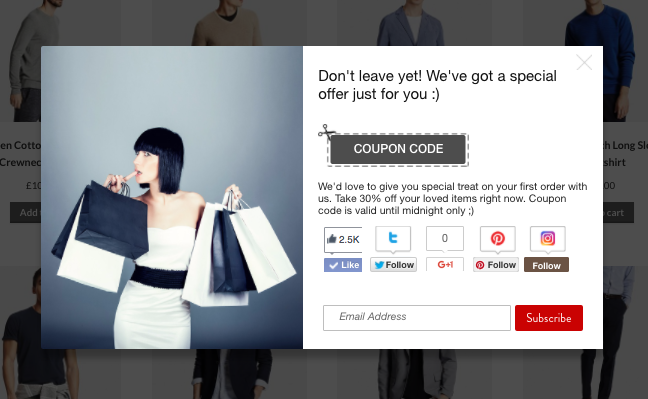 For example, an online retailer has customized their exit intent popup messages based on customer behavior. The result was a 10x increase in transaction rates from cart abandonment. “You have items in your cart”: a reminder message notifying online shoppers that they have left something on their shopping cart. “You have viewed this product”: alerting your online shoppers that they shouldn’t leave without purchasing their most viewed product. “Share your cart on Facebook or Twitter”: Some online shoppers have successfully added a product to their carts, a simple tactic is to promote your social media accounts. Exit intent popups of Checkout Boost app show at cart page to target customers who already add items to cart but are about to abandon. “Sign up to our newsletter and receive exclusive deals”: If you have shoppers who are very meticulous about prices, a great way to make sure to build that customer relationship is through emails. If you convert your visitors to loyal subscribers, there’s a less likelihood of an abandoned cart. Today’s consumers have embraced the ease of online shopping. Along with that is the demand of online shoppers for a seamless process in their shopping experience. If your online store can’t provide speed, security, simplicity and affordability, then expect your online shoppers to abandon their carts. If you change your perspective, you will see shopping cart abandonment as an immense opportunity. $250 billion worth of lost orders can be recovered. 74% of your abandoning visitors intend to return. And exit-intent popups do wonders in turning a leaving visitor into a successful sale. 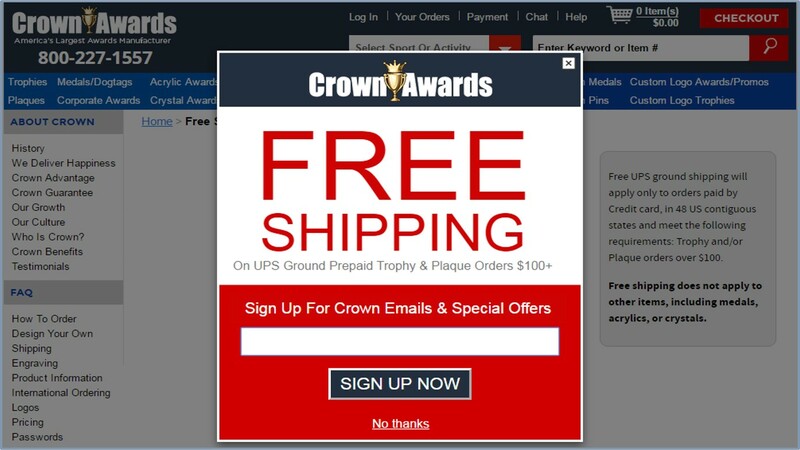 We have presented you with best exit-intent popup practices. Let us know which ones work best for you.